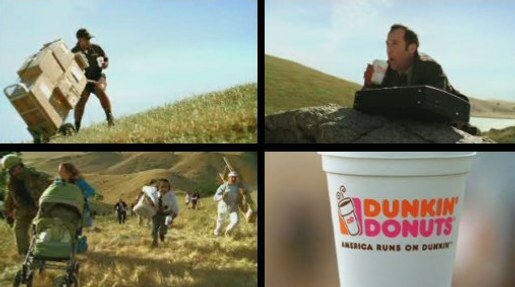 Dunkin’ Donuts has released a new commercial promoting one of its core products, coffee. Working with Boston agency Hill Holliday the company went with the inspirational concept, “No matter what uphill battle you’re facing, you can take it on with a fresh cup of Dunkin’ Donuts coffee in hand”. Dunkin Donuts…Hustle doing the Uphill Battle from Hustle Hustle on Myspace. The Uphill Battle concept was developed at Hill Holliday, Boston, by chief creative officer Kevin Moehlenkamp, group creative directors Tim Cawley and Kevin Daley, copywriter Jeff Baxter, art director Bob Gates, agency executive producer Brad Powell. Filming was shot by director Andrew Douglas via Anonymous Content with director of photography Flor Collins.